I'll be doing more buy-guides in the future, about many different items. It's a new obsession of mine: Lace dresses! Especially the long sleeved ones are très chic. I'll take an example model from an expensive brand and try to find cheaper alternatives. You can click on the pictures to go to the respective sites. Such an amazing dress! If I had the money, it would be in my closet, definitely. But I'm not rich so I look for alternatives! 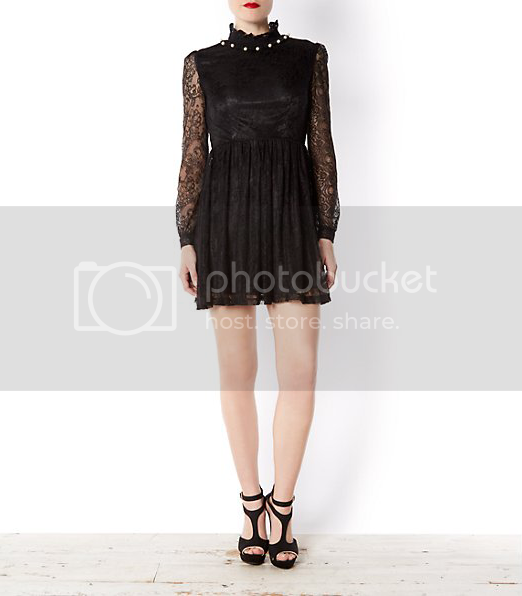 We will be looking at two dresses from 3 clothing sites: Veromoda, Topshop and Newlook. I found three dresses that kind of matched the main dress. 1 is more of a party dress whereas the number, I love the one-shoulder. 2 looks a little bit more casual. A bit more pricey than than the previous ones. The first one is a bit more casual, whereas the second one seems more grungy. These are more casual and more cheap than the last 2 shops. The first one has a lovely gothic vibe. The second one has more lace, though. I hope you found this useful. I look forward to be seeing you next time. Did you think I should have included some items? Do you have suggestions for sites to look on for awesome fashion for less? Tell me please! I'd love some feedback.